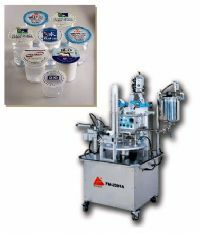 An ideal unit for disposable cup filling and sealing. Economically priced! Simplified Construction! Juice, mineral water, disposable cups, etc. * The machine requires an air compressor for operation. * The machine frame is manufactured from stainless. steel to meet sanitation standards. * Stainless steel sealing knife. * Equipped with waste film rewinding shaft. * Employ timer for controlling filling time. * One cup sealing at a time. * Employ PLC control for added convenience of operation. * Rotary type filling and sealing. Established in 1981, Seal Pack Machinery Co., Ltd. is highly reputed manufacturer of automatic packaging machinery. Seal Pack specializes in design and manufacturing of a wide range of food and beverage filling sealing packaging machine. Based on Seal Pack's extensive manufacturing experience, we are qualified to provide whole plant planning, machine design and supply. Please contact us for the best machine selection.